Are you looking for some awesome free WordPress themes? Well, you’ve reached the right place to find them! There is a huge choice of WordPress themes available for WordPress blogs and websites, and it is often difficult to choose one to suit you. Many are free, but that does not mean that they are of low quality – on the contrary. Many of the best WordPress themes in use today are free to use! Even then, there is still a massive choice available, so we are going to help you choose. Here are our top ten free WordPress themes. They have been chosen for their layout, theme and level of customization to meet your specific needs. If you choose one of these themes then you can be sure that it will help you to create a well-designed blog and a beautiful, professional-looking website. Bizlight is one of the best, awesome, highly customizable theme. Bizlight is a free WordPress theme that attempts to top commercial templates in terms of design and functionality. Some of its features include responsive design, page templates for different layout styles and an advanced interface for the theme settings. 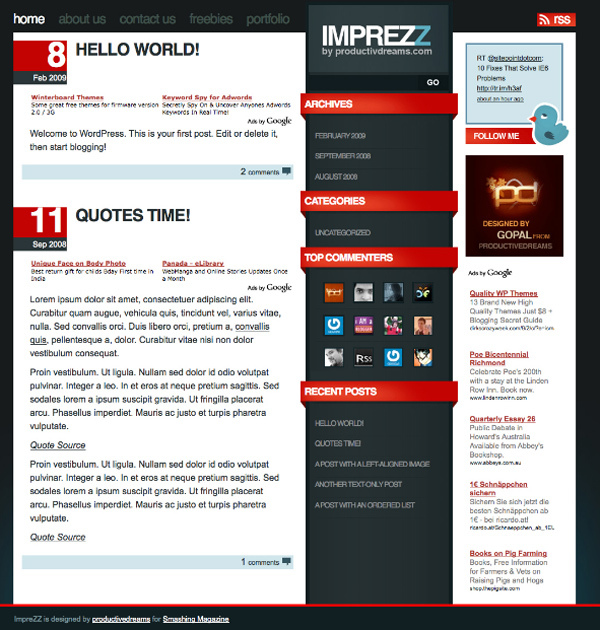 Sydney is a free WordPress theme designed mainly for business use. Created by aThemes, available in both a free version and a Pro paid version. There is plenty of customization available, including layout and logo control, a full-screen slider, sticky navigation and access to all Google Fonts. iBusiness is a modern design free premium WordPress theme with options page and about section at homepage. Suitable for any niche especially for company homepage or business type websites. The Hestia WordPress theme offers a modern appearance to any website or blog. If you want an online shop, then Hestia is the ideal choice. It offers a full-width slider, widgetized footer and is superb if you use newsletter forms. Hestia is SEO friendly and is compatible with WooCommerce and page builders. 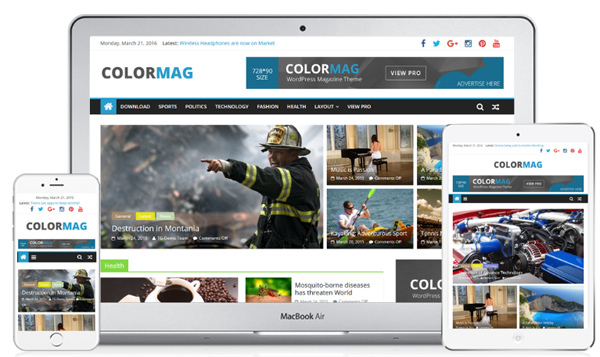 ColorMag is the ideal WordPress theme for publishing newspapers, magazines and other forms of publication. If you have a news site, then this is an ideal choice. It offers a range of colored buttons, a feature slider and can also be adapted to any use you wish – it is not restricted to news and can be designed to present beautiful sales pages. It is WooCommerce compatible with over 15 widget areas and a number of social icons. 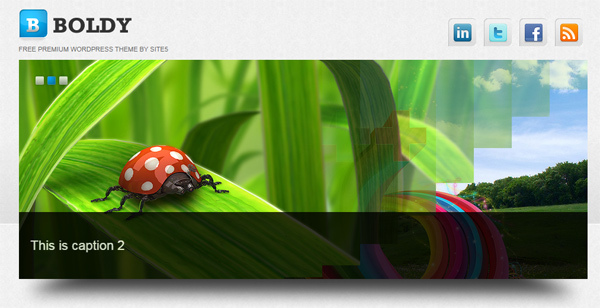 Parallax One is suitable for use with any type of website or blog. 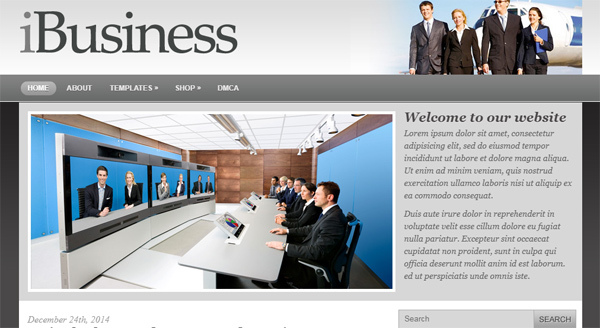 It offers an amazing parallax header which promotes the classy modern appearance of the page. Pricing tables and much more – excellent for a free WordPress theme. The look and feel of this theme are good, because of an irregular place of things. FlyMag is a versatile free WordPress theme, with a clean and crisp look that is ideal for magazines and news blogs. It features image sliders, carousel sliders that can be dragged into position and FlyMag is ideally suited for multiple images. It is also translation-ready for publication in multiple languages. Like these popular, free WordPress themes? Don’t forget to share this post with your friends! 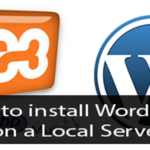 If you know any other best free WordPress themes then don’t forget to share with us! May I suggest: https://theme-stop.com/themes/viral-mag/ which is a free popular Adsense optimized magazine theme that I think would be of interest to your readers.